It's been awhile since the full DC has met for a dinner party. Having lost two of our members to a recent move out of the city, the arrival of a new baby to another couple, and the difficulty of finding available dates for 8 people with completely crazy schedules, it's been tough going for a few months! But we are back on track this week! While the dinner parties themselves are always fabulous fun, I have to say that the days leading up to them are a bit stressful. It is quite a competitive and creative group so deciding what you can do to "wow" them takes some thought and time. And of course with our schedule of private and public events these last two weeks, we've been too tired to tap into our right-brains for exciting ideas. First we have to come up with the dish itself, as everyone is assigned a course that rotates with each party. Then figuring out where, when and how shop for your ingredients is the next challenge. This week we are meeting on a Thursday, so I had to make sure I got to the Farmer's Market on Tuesday to get a few of the ingredients that I new I couldn't find anywhere else. Today I have to schedule a trip to Whole Foods and World Market. Why World Market you ask? Plating! Our challenge this week is "fantastic presentation" which means besides the stress of coming up with something that tastes fabulous, it has to look fabulous as well. I've found that World Market has a pretty good selection of inexpensive plates and dishes that look good too, so I'll be running over there to see what I can find. We also have to consider what kind of prep time and materials we need to bring with us as the final stages are done in a kitchen that is not your own. And then there is the wine pairing which somehow has taken a back seat to efforts that go into creating the dish. Everyone is so focused on the food that the wine has become almost an afterthought. But with each couple having at least on person either in or having been in the wine business at some time, we're always drinking something good! And everyone is experienced enough in food and wine that the pairings are almost always good, but work to varying degrees! Now, what are we going to cook? We will be preparing one of two appetizer courses so I've been skimming the internet and my cookbooks to be inspired by something that wouldn't take too much time to create. 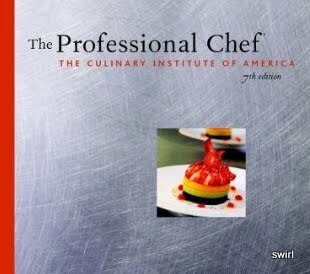 Pulling out one of my favorite books, CIA's The Professional Chef, I was looking for some ideas on creating a savory flan. Having never done one, I was a little nervous about it and knowing there would be no time for a practice run. I've been anxious to do one ever since our dinner at a Mano where Chef Josh Smith did a delicious Porcini Mushroom Sformato. But, low and behold, on the cover of this massive book was a small photo of an appetizer that looked fabulous. Checking it out, I saw that the cooking was minimal, but the end result was beautiful, just what I was looking for! It is sort of a deconstructed salad, which means I can keep the actual cooking to a minimum, a good thing considering I will only have a few hours tomorrow afternoon to throw this together. We figure out who will do what part of the dish, prep as much as we can in the afternoon and then load everything in the car so we can finish it up right before we present. We always like to include fresh, local ingredients when possible, so I changed the recipe a bit to include some things I new I could find at the CC Farmers Market. The recipe called for mangoes so I subbed fresh Alabama peaches; instead of lobster I bought Gulf shrimp; local tomatoes for the garnish and some beautiful bibb lettuce to line the plate. So hopefully you are curious by now as to what we did so here is the dish and the instructions. I'll show you step by step how and what we created and the end result. Now I have to admit that there are a lot of steps, but everything is pretty simple if you take your time and quite a few things can be prepared ahead. Let's start by talking about the end result that I was attempting to achieve, a layered salad of beets, avocado, peaches, fresh goats cheese and shrimp with the fruit and veggies being cut by a circular mold so that they were the same size and stacked on top of one another with the shrimp crowning the top. Plating and Molding: We opted to buy some of the rectangular plates from World Market that we use for our cheese presentations at the shop. The shape meant we would have to add some extra elements to the dish, but we both like the clean look that complemented the simplicity of the food. I was also able to get the circular mold there, basically a metal cookie cutter. Knowing the diameter of the peaches would be fairly small, I was lucky to find a set of them in all different sizes, one would be the right fit! Mix all ingredients together in a bowl and refrigerate for an hour. Using about 1/2 teaspoon of the mixture, roll into a small ball in the palms of your hands. Put in a covered container in the frig until you are ready to plate. You will have extra to spread on fresh figs and drizzle with honey...yumm! The Beets, Part I: I bought six large beets, knowing I had to get 8 circles of the correct diameter and figure I could get at least two from each and have extra in case I screwed anything up. You can either roast or steam your beets, but be careful not to overcook them as they will get too soft and be difficult to cut and handle. Heat the oven to 375°F and arrange a rack in the middle. Rinse the beets and trim off any leafy tops. Wrap in aluminum foil and place in the oven. Roast until tender and easily pierced with a knife, about 1 hour. Remove from the oven and let cool. The Shrimp: I bought 1/2 pound of fresh Gulf Shrimp and decided to prepare them ceviche style to enhance the citrus in the dressing and goat cheese. I knew that lying them on the top layer might be difficult so I sliced them in half lengthwise so that they would be easier to work with. Bring a pot of salted water to a boil and briefly cook the shrimp, one minute only! Remove with a slotted spoon into a bowl with ice water to stop the cooking. Cool, drain and slice lengthwise. Put the shrimp bowl and squeeze equal parts lemon and lime juice over them until covered. Let sit in the frig for at least an hour. The Dressing: Ok so we don't usually make dressings at home, we just drizzle balsamic vinegar or lemon juice and top with roughly 3x the amount of olive oil. But I decided to follow the recipe's white wine vinaigrette and see if we liked it. The problem was that the amounts were in ml and made like a gallon (maybe not quite that much...) of dressing so I had to cut everything down. We did end up liking it though, so it was worth the trouble. Combine lime, lemon juice, chardonnay and shallot and whisk in olive oil gradually. Add the chives and season to taste. Be sure to mix well before you use it. Assembling the "Salad": The above items can all be prepped ahead of time, but you don't want to start with the next steps until just before serving as the avocado and peaches may begin to brown. You should start these steps about 30 minutes before serving time. The Lettuce: You can use any type of lettuce leaves (except Iceberg) as long as the stems allow them to lie fairly flat on the plate. I used bibb lettuce that I bought at the farmers market and cut out the bottom part of the stem. -16 medium sized lettuce leaves Wash and pat dry. Arrange on 2 leaves on each plate opposite each other with the stem sides touching. The Garnish: Take 8 grape or cherry tomatoes, cut in half and de-seed. Slice into super tiny little slices and the mince. Put in a bowl, season with a bit of salt. You won't need this again until the very end. The Beets, Part II: When completely cool, slice of the ends and then cut an even 1/2" wide slice. Using the appropriate diameter metal cutter, put it in the center of slice and cut downward to get your perfect beet disc. Cut as many 1/2" discs from each beet as you can that will be large enough to use the cutter (2-4, depending on the size of the beet). Place the disc in the center of the plate on top of the lettuce leaves. Brush the top of the slice with a little of the dressing, but be careful not to drip it down the sides. The Avocado: The trick with the avocados is to find ones that are firm but ripe. If I was careful, I could get 2-3 cuts from each one, but again, I bought extra for backup. Cut of the end at a point that will be wide enough for the cutter, you don't need to peel them. Using the appropriate diameter metal cutter, put it in the center of slice and cut downward to get your perfect avocado disc. Cut as many 1/2" discs from each avocado as you can that will be large enough to use the cutter (2-3, depending on the size of the avocado). Place the disc in the center of the plate on top of the beet disc. Brush the top of the slice with a little of the dressing, but be careful not to drip it down the sides. The Peaches: Again you are looking for fairly large, ripe but firm peaches. The local peaches gave me 2 slices per fruit. Cut of the end at a point that will be wide enough for the cutter, you don't need to peel them. Using the appropriate diameter metal cutter, put it in the center of slice and cut downward to get your perfect peach disc. Cut as many 1/2" discs from each peach as you can that will be large enough to use the cutter (2-3, depending on the size of the peach). Place the disc in the center of the plate on top of the avocado disc. Brush the top of the slice with a little of the dressing, but be careful not to drip it down the sides. The Shrimp, Part II: Take your shrimp out of the frig, drain juice and pat dry before assembling. Using 2 slices per dish, arrange on top of the peaches in a circle, there should be sort of a hole in the middle to place the goat cheese balls. Brush the top of the slice with a little of the dressing, but be careful not to drip it down the sides. The Goat Cheese Balls, Part II: Remove your goat cheese balls from the frig and taking some of your left over chives, carefully insert a few into the top of each ball. Place the balls on top of the shrimp. Final touches: Spoon a small amount, about 1/2 teaspoon of the tomato mixture in 2 places on the the plate. The Last Word: So we invited everyone into the kitchen and had the dishes placed on the table when they came in. Cutting into it was a bit difficult, mine sort of toppled over onto the plate, but once you bit into the different flavors and textures, everything really worked. I have to admit, for a last minute decision and no practice run, it was a "fabulous presentation", excellent wine pairing and it tasted pretty damn good too!